The Pink Pelican is all yours!!. 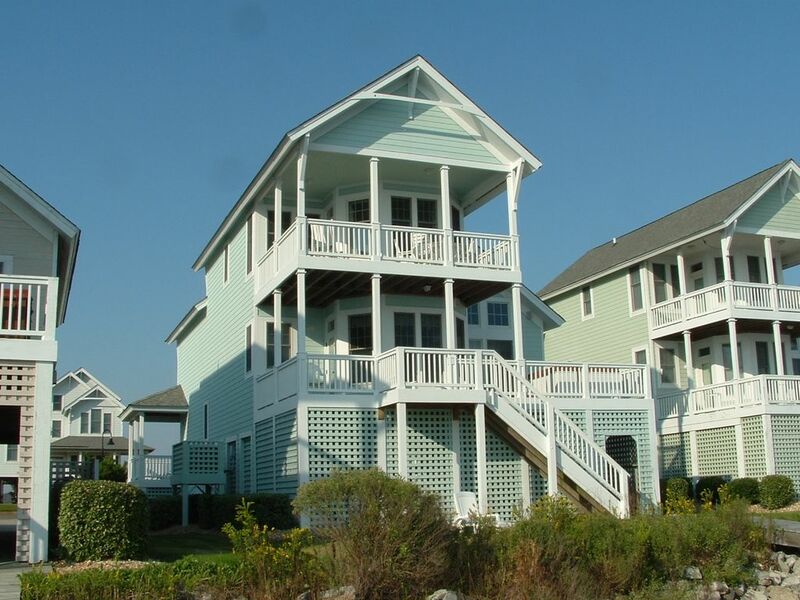 This Pirates Cove favorite vacation rental is now available by owner. Enjoy the stunning waterfront cottage for up to 14 guests. Yes, waterfront, private dock, private deck top hot tub open all year, 3 furnished decks 2 overlooking obx. Resort amenities include a short course olympic size pool and Jacuzzi, 6 miles of docks weaving through the resort for strolling, state of the art fitness center, volleyball courts, tennis courts, playground, meeting room with pool tables. One of the best restaurants on the outer banks is located in the resort. Enjoy the Tiki bar at the marina for summertime cocktails. Pirates Cove is home a world class marina hosting numerous fishing tournaments both on and off shore. Speaking of boats, you are welcome to bring yours and tie up at our private dock or our interior slip --all included. Sound fun? We love Manteo so much that we own and operate 5 vacation rental properties in old town We have loved our home in Pirates Cove and have decided to add the Pink Pelican to our cottage properties for your enjoyment. Please find our cottages listed under other listings --really something for everyone! toilet, little but all that is needed! We very much enjoyed our week at the "Pink Pelican". Everything is as close to perfect as you can get. The house is in a great location in an excellent development (Pirates Cove". It was very quiet and private even though surrounded by other houses, The water view is very nice and in the summer the sound would be good for kayaking. The kitchen is very well equipped, the beds comfortable, the spa spotless, and the owner responsive. I wholeheartedly recommend this property as long as you can climb lots of stairs. Sharon was so attentive to anything we needed during our stay. The house was perfect for us and the view outstanding. We felt like we were on a house boat! We enjoyed a morning walk and the our kids enjoy use of the gym. We even were able to bring our dog. We recommend he pink pelican with 5 stars !! We loved the pink pelican! The pink pelican was a fabulous rental. It was comfortable and clean and a beautiful setting. Comfortably made up beds, nice clean and fresh towels with a fully stocked kitchen for cooking anything! We truly loved The luxury.... it’s all there! Wonderful home with a great view. The house is more then can be expected. Walked into a clean well equipped house. Great stay for the 2nd year in a row and plan on a 3rd return. Thank you for the trust and use of your home. The Pink Pelican is wonderful!!! I totally recommend staying at the Pink Pelican, and I hope to again! The decor is very pretty. There is plenty of room for a large family to enjoy both inside and outside. We spent lots of time on the porches and dock … in October! The view of the sound is beautiful! I can't say enough nice things about Sharon, the owner. She will do everything she can to make your stay enjoyable, both before and during your stay. Wonderful home, view and owner! I highly recommend. Outstanding house and location!. Such a beautiful view from the decks! Just an absolutely perfect weekend. The house had everything you need. Furniture was comfortable; kitchen well stocked; well decorated. Having a deck right outside the master suite on the upper level was beautiful, looking out on the sound. Dolphins sighted every morning. Deck furniture is also very comfortable. Location inside Pirates Cove was perfect with restaurant on property. Drive to Manteo was quick and easy, and only took minutes. Owner, Sharon Watson, could not have been more accommodating and a real pleasure to work with. Really the best we've ever worked with and we've renting houses over the last 20 years!